The global botulinum toxin market was valued at US$ 4,527.0 Mn in 2017 and is projected to reach US$ 8,718.7 Mn by 2026, expanding at a CAGR of 7.6% from 2018 to 2026. Increase in the prevalence of spasticity and cervical dystonia and the number of cases of migraine is expected to drive the botulinum toxin market during the forecast period. Surge in the rate of adoption of non-surgical botulinum toxin procedures, due to their noninvasive or minimally invasive nature, is boosting botulinum toxin market. Rise in the number of worldwide geriatric population and incidences of esthetic issues, such as crow’s foot and lateral canthal lines, is a key factor that is anticipated to propel the botulinum toxin market during the forecast period. However, lack of awareness regarding the advancements in non-surgical esthetic and therapeutic procedures is a major factors hampering revenue generation in the global botulinum toxin market. The global botulinum toxin market has been segmented into product type, application, and region. In terms of product type, the market has been classified into botulinum toxin type A and botulinum toxin type B. The botulinum toxin type A segment held a prominent share of the global botulinum toxin market in 2017. Increase in prevalence of cervical dystonia, spasticity, glabellar lines, and crow’s foot and rise in the use of botulinum toxin type A are key factors driving the market. The botulinum toxin type B segment is expected to expand at a considerable CAGR during the forecast period. Advantages of botulinum toxin type B, such as faster onset of action and faster recovery time, and introduction of new and improved type B products in the market for new indications are major factors propelling the segment. Based on application, the global botulinum toxin market has been segregated into esthetic and therapeutics. The therapeutics segment dominated the global botulinum toxin market in 2017, owing to global rise in the cases of migraine and increase in the demand for non-surgical therapeutic procedure, which is noninvasive or minimally invasive in nature. The esthetic segment is anticipated to expand at a higher CAGR during the forecast period, owing to the increase in prevalence of lateral canthal lines and face wrinkles. Based on region, the global botulinum toxin market has been segmented into North America, Europe, Asia Pacific, Latin America, and Middle East & Africa. North America dominated the global botulinum toxin market in 2017, owing to the rise in awareness level regarding non-surgical esthetic and therapeutic procedures. The botulinum toxin market in North America is expected to maintain its dominant position in the global market during the forecast period. The botulinum toxin market in Europe is expected to expand during the forecast period, due to increase in geriatric population. The market in Asia Pacific is projected to expand at a comparatively higher CAGR during the forecast period, owing to the rise in adoption of non-surgical botulinum toxin procedures by the geriatric population and favorable government regulations. 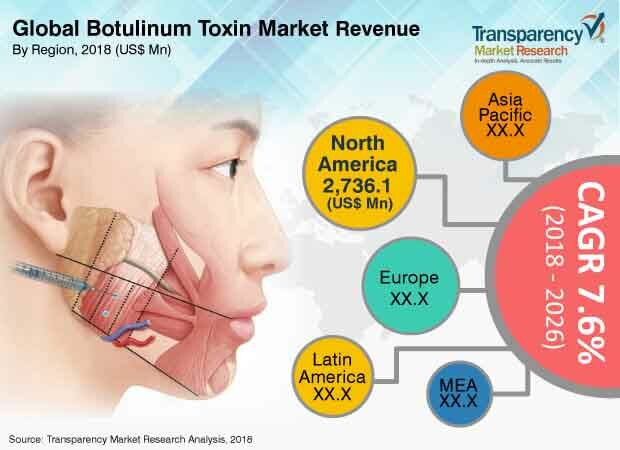 Prominent players operating in the global botulinum toxin market include Allergan, Inc., Ipsen Group, Merz Pharma GmbH & Co. KGaA, Medytox, Inc., US Worldmed, LLC, Galderma, Metabiologics, Inc. (US), Lanzhou Institute of Biological Products Co. Ltd. and Revance Therapeutics, Inc. Allergan, Inc., Ipsen Group, and Merz Pharma GmbH & Co. KGaA are the prominent global market players in the botulinum toxin market. Allergan, Inc. has strong regional presence, either direct or through subsidiaries, distributors, and partnerships. Extensive research & development, international presence, robust marketing, and product reliability, provide the company, an upper hand over its competitors. This report analyzes the current and future scenario of the global botulinum toxin market. Botulinum toxin is a neurotoxin that is produced by the bacterium clostridium botulinum. There are around eight types of botulinum toxins A-H, produced by the bacterium. Botulinum toxin type A is capable of causing diseases in humans; however, it is widely utilized commercially and medically for the treatment of several aesthetic diseases such as glabellar lines, crow’s foot, and face and forehead wrinkles. Botulinum toxin is also utilized in the therapeutic treatment of spasticity, cervical dystonia, and migraine. Botulinum toxin procedure is a non-surgical cosmetic procedure that is noninvasive or minimally invasive in nature. Botulinum toxin procedure is a non-surgical and noninvasive or minimally invasive and has several advantages, such as no downtime, less time of surgery, no need of hospitalization, and faster recovery, over conventional cosmetic or aesthetic surgeries. The global botulinum toxin market is expanding at a high pace owing to the increase in prevalence of cervical dystonia and upper limb and lower limb spasticity. Rise in global geriatric population and adoption of new non-surgical aesthetic procedures is fuelling the market. Growing incidences of glabellar lines, face and forehead wrinkles, and crow’s foot and consistent worldwide rise in cases of migraine are boosting the market. Furthermore, rising number of skilled professionals performing non-surgical botulinum toxin procedures, favorable government regulations regarding the commercial usage of botulinum toxins, and advantages of faster onset of action of botulinum toxin procedure over traditional cosmetic procedure are propelling the botulinum toxin market. This report on the global botulinum toxin market comprises an elaborate executive summary, including a market snapshot that provides information about various segments of the market. The report also provides information and data analysis of the global market with respect to its segments based on product type, application, and region. A detailed qualitative analysis of drivers, restraints, opportunities and trends of the market has been provided in the overview section. Additionally, the market outlook section offer key insights of the global market such as price comparison analysis, pipeline analysis and launch & patent expiry snapshot. It also provides market attractiveness analysis, in terms of region and key strategies adopted by players, thereby presenting a thorough analysis of the overall competitive scenario prevailing in the global botulinum toxin market. Botulinum toxin market has segmented into product type, application, and region. Based on product type, the botulinum toxin market has been classified into botulinum toxin type A and botulinum toxin type B. Based on application, the market has been bifurcated into aesthetic and therapeutics, which are the main application areas of the market. Each of the segments has been analyzed in detail in terms of market trends, recent developments, drivers, restraints, opportunities, and useful insights. The report gives current and future market size for each segment and sub-segment of the market for the period of 2018 to 2026, in terms of revenue depicted in US$ Mn, considering 2017 as the base year and 2016 as the historical year. The compound annual growth rate (CAGR) has been provided for each segment and the overall market for the period of 2018 to 2026, along with market size estimations. In terms of region, the global botulinum toxin market has been divided into North America, Europe, Asia Pacific, Latin America, and Middle East & Africa. The regions have been further sub-segmented into major countries and sub-regions. The current and future market size, in terms of value, of the botulinum toxin market at the regional and country level has been provided in the report for the period of 2016 to 2026, along with their growth rate in percentage for the period of 2018 to 2026. The study also provides useful insights of the market, expected to help new companies willing to enter the market and existing companies seeking to increase their market share. The report profiles major companies operating in the global botulinum toxin market in terms of attributes, such as, company overview, financial overview, product portfolio, business strategies, recent developments, and SWOT (strength, weakness, opportunity, and threat) analysis. Major companies mentioned are Allergan, Inc., Ipsen Group, Merz Pharma GmbH & Co. KGaA, Medytox, Inc., US Worldmed, LLC, Galderma, Metabiologics, Inc. (US), Lanzhou Institute of Biological Products Co. Ltd., and Revance Therapeutics, Inc.